I spent two-and-a-half memorable days in Maui. I had great hosts at the Napili Kai Beach Resort, it was hard to leave my room and that gorgeous view! When I did leave I met the warmest, most gracious people, they taught me the meaning of ohana. 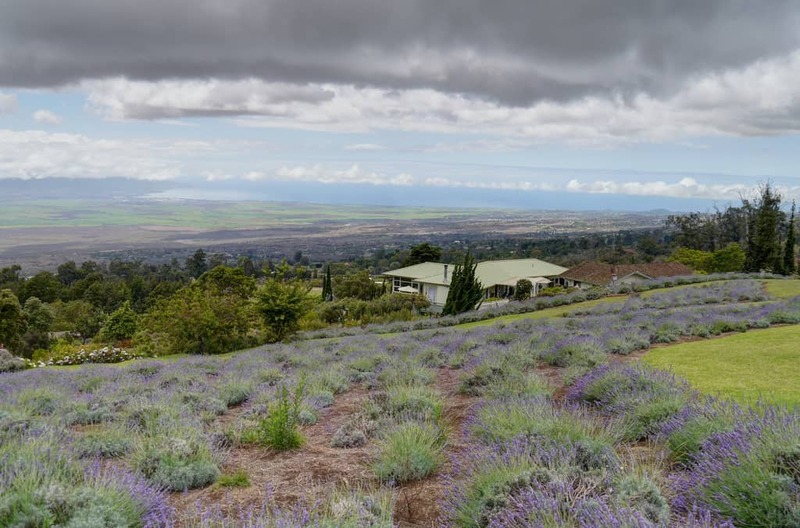 After a relaxing half-day of just doing nothing, I had jam-packed, farm-filled adventures at Ali’i Kula Lavender Farm, Ocean Vodka farm and the Surfing Goat Dairy, oh and there may have been some pie eating too! My last morning as I headed to the airport, I picked up a latte from the local coffee shop and the beautiful little lei on top of my foam made me feel a little sad. I was not ready to go back home! I have one last thank you and that is to the awesome Hawaiian Airlines. I flew with them from Oakland through Maui to the Big Island and then back. I had never flown Hawaiian Airlines and was really impressed. They are super organized when it comes to on-boarding, they are the only American airline that still serves a free hot meal which features local dishes, and they offer local snack products like Maui Onion chips, macadamia nut cookies and Ocean Vodka for their mixed drinks! I had the opportunity to meet with two people from their PR team while they visited San Francisco last week and these guys are growing like gangbusters. Lots of good things coming from them in the future. I enjoyed my flights immensely and the team there is super friendly as I have come to expect from everybody in Hawaii now! And that’s a wrap! My magical trip to the Hawaiian islands may not look like the most people’s trip, but I am okay with that, I had a fantastic, educational, inspiring trip and I cannot thank the Hawaii Visitors and Convention Bureau enough for their generosity in planning such an exceptional itinerary. Their Go Hawaii website is the only site you need to plan your own phenomenal experience, no matter what island you choose. I hope my trip inspires you to see Hawaii in a different light and hope you are as anxious to go there as I am to return! How about you? Have you been to Hawaii? Which islands? What did you like best? My visit to Hawaii was courtesy of the Hawaii Visitors and Convention Bureau, my farm tour was comped. As always, all opinions are my own. You can also view more of my trip to Maui in my Magnificent Maui Wanderlist on AFAR. I am also playing around with TagBoard, you can see all my Instagram photos together in one spot on my #MWAinHawaii board. I haven’t made it to Hawaii, yet. But, my dad goes all the time for work and pleasure. He is always telling me all about the wonderful things about Hawaii, and all it has to offer. OMG I wanna use this airline if I go. What fun items they serve and for free. Never been, but would love to go! It’s on the bucket list! Hawaii would be a good place to go. Maybe I will win a trip there, lol. Hawaii certainly sounds like a beautiful place to be. It’s amazing you’ve been able to travel so much! Thanks for sharing about your experiences. @Julia, as someone who went to Hawaii twice last year I can say I whole-heartedly agree with you.